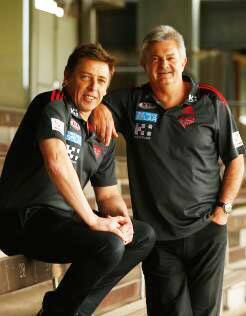 MARK Thompson has been appointed as Essendon's interim coach, and he will lead the club for all of the 2014 season. James Hird's 12-month suspension for his part in the supplements saga will end in August next year, but the Bombers confirmed at a media conference on Thursday that Thompson, a dual premiership coach with Geelong, will coach out the season. "James's view was that it would be unwise to come back and take up the coaching again right at the end of the (season)," Essendon chairman Paul Little said. "The decision was taken very early in the piece that that wouldn't happen." Little said that Hird would resume as coach in the lead-up to the 2015 season. As reported on AFL.com.au on Wednesday, former Adelaide coach and Melbourne caretaker Neil Craig has been appointed to a senior role as head of coaching development and strategy. Craig had one year to run on his contract with the Demons, and Melbourne paid him out in full after making his position as director of sports performance redundant, despite the fact he has stepped straight into another job. "My involvement directly with the players would, I would think, be minimal," he said of his new gig with the Bombers. "Clearly, part of my responsibility is to work really closely with the coaching group, and that's the assistant coaches and, in particular, the development coaches. "And also to work closely with Mark. That'll unfold and that's part of the working relationship about how that will go." Simon Goodwin, who was a candidate for the interim role, has been promoted to senior assistant coach status. "We're going to invite him into our world and train him up to be a senior coach, whether it's here or somewhere else," Thompson said. "He's certainly got the skills to do it, and for a lot of the second half of the year he was basically doing a fair bit of the work." Despite repeatedly saying in recent months that he did not want to be a senior coach again, Thompson insisted that he was "very, very committed and excited" to take up the position. "I was flat after the year, like any season, but a bit more so this time," he explained. "A couple of weeks later, well, I thought about the football club and how I was looking, and I'm happy to be part of it. "I spoke to a lot of people – the board and a few players – and a lot of advice has been given. "(The players) wanted a coach that wasn't going to just sit idle … and give them the best opportunity to be the best that they can be. "So they did want to know whether I was committed. "I openly stated in the past that I didn't want to coach. Well, I think I really wanted to do it for (the 2014 season), and that's what I want to do." Little was at pains to describe the process that led to Thompson's appointment as genuine, even though the drawn-out saga, during which Leigh Tudor and Goodwin were among the people interviewed, simply resulted in Hird's lieutenant being promoted. And Terry Wallace, who was on the club's sub-committee to find a coach, told Gillette AFL Trade Radio he felt Thompson was always the right man for the job. Thompson has served as Hird's senior assistant for the past three seasons after ending his 11-year term as senior coach at Geelong. "I think I've been a little bit disappointing in my role in the last three years. I haven't achieved what I wanted to achieve," he said. Thompson was fined $30,000 for his part in the supplements affair that saw Hird suspended. "I'm a pretty proud man, and I think the way people are looking at Essendon is not what I wanted them to see," he said. "We're a pretty proud group, proud club, and we just want to build again. "And I don't think they're looking at it that way at the moment."